The past few years have brought a transformative sonic and aesthetic overhaul to our rosewood 800 and 900 Series, along with our maple 600 Series. This year we’ve applied our creative strokes to invigorate the 500 Series in several exciting — and surprising — ways. The end result: a colorfully retooled series that delivers as much guitar-playing diversity as any in the Taylor line. Click on the image to go to the Taylor site to see all of the changes and specifications. 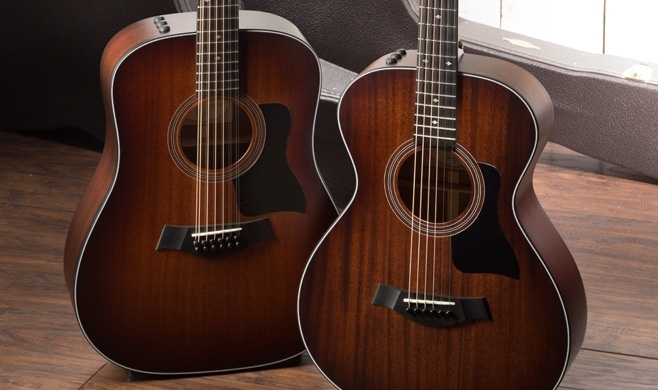 Taylor’s 300 Series boasts an exciting assortment of new tonal flavors for 2016. For starters, Tasmanian blackwood, a tonewood we love, joins the series as the standard back and side wood on models featuring a mahogany top. (The tonewood pairing of sapele/spruce continues.) Next, our focus on 12-string and 12-fret designs this year has sparked new models for each within the series. Finally, we’ve refined the aesthetic appeal of the series with a shaded edgeburst on mahogany-top models and a shift to Italian acrylic small diamond fretboard inlays across the entire 300 Series. Click on the image to go to the Taylor site to see all of the changes and specifications. Among Taylor’s rosewood/spruce guitars, the 900 Series has always projected an aura of high-end sophistication, showcasing a detail-rich aesthetic and the most refined levels of Taylor craftsmanship. A lush redesign has brought a sleek and comfortable hand-carved ebony armrest to the series, along with the same sweeping array of tonal-enhancing refinements first applied to the 800 Series. On the 914ce, the Grand Auditorium’s all-around versatility has been punched up to produce a more powerful bass response and a warmer, sweeter midrange. The refreshed appointment scheme boasts a beautifully calibrated balance of ebony binding and koa purfling, together with colorful abalone shell inlays and trim. Additional features include a Venetian cutaway and Taylor’s Expression System® 2 pickup.